You're investing in your retirement? Good. 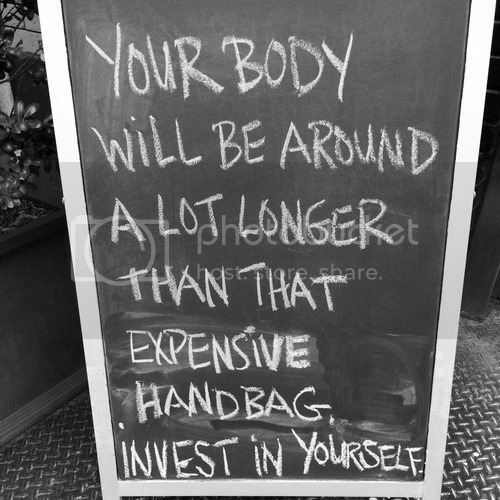 But are you investing in your health? I can't imagine that having all the money in the world would be much fun if you weren't agile and mobile enough to enjoy the fruits of your labor. Someone a long time ago once said, (don't ask who, I wasn't alive back then) "the rich invest in time; the poor invest in money." 1. Take A Trip To The Mediterranean. This is already so much more fun than stocks and bonds! A study published last year in the New England Journal of Medicine showed that people who followed the Mediterranean diet, rich in fish, fruits, vegetables, legumes, olive oil, nuts, and even red wine, reduced their risk of heart attack, stroke, and heart-disease-related death by about 30%. Scientists believe the various nutrients work synergistically to help reduce inflammation and oxidation in the body. If you can't budget a trip this year, pick up a Mediterranean cook book and practice at home during your stay-cation. 2. Follow Your Health Trends. The next time you get bloodwork done at the doctors office, jot down your figures in a Word document or tracking app. The organisation will make it easier to spot spikes and dips. "A trend line is always more meaningful than an absolute number," says James Scala, Ph.D., a nutritional biochemist. For example, if your weight and blood sugar both start trending up, it might be a good indication that you need to ask your doctor about adult-onset diabetes or at least get a second opinion. 3. Hire A Nutritionist-Know-It-All. This is my favorite one. You have a doctor, a dentist, maybe even a cardiologist, but you may be overlooking one of the most useful advisors of all: a nutritionist. Poor eating habits and obesity are starting blocks of disease, so diet advice is key. Lets say your latest test results show you have high blood pressure…a doctor will prescribe a small pill, tell you to take it once a day and send you on your way. But 85-95% of hypertension (high BP) can be treated through nutrition alone. What you eat can be the best medication you ever take. Seek out someone who's invested in your health, not just your treatment. 4. Be A Quitter. If you're a tobacco user invest everything you can into kicking the sticks. No other health habit will have a greater effect on the quantity and quality of your years. A large study published in the Lancet suggests that smoking can cut more than 10 years off your life. But if you break the habit before age 40, you can cut the excess mortality associated with lighting up by about 90 percent. It's never too late. Any investment you make in smoking cessation will have huge payoffs. 5. Make Home In A Health Haven. These cities ranked highest in an analysis of 78 quality-of-life indicators that included health care, cultural opportunities, and transportation convenience. The Milken Institute has identified the following metropolitan areas in which you have the best chances of "ageing successfully". 6. Exercise Your Creative Muscle. Stress is one of the biggest premature agers as it leads to many unhealthy behaviors like smoking, drinking, and yo-yo dieting, all of which take a toll on your body. To ease anxiety and preserve your youthful skin, devote your time and money toward cultivating a hobby you enjoy. Exerting your creative juices can help ease the stress of daily life and help you keep your youthful glow. I mean…if the doctors prescribing a game of pickup soccer or getting lost in your music for a few hours a week, are you really going to argue with him!? 7. Remove Your Shoes. Visit a podiatrist to minimize your risk of hip, back, and knee problems. "If you don't have a good foundation--if you have flat feet or high arches, for example--then the joints in the rest of your body will be stressed as they try to compensate," says Andrew Shapiro, D.P.M., a podiatrist based in New York. Over time, this can result in tendinitis, arthritis, plantar fasciitis, and joint pain, he says. So make sure you've got the right support for your soles. 8. Get Cozy With Your Community. According to the Longevity Project, a landmark study that tracked 1,500 individuals for 80 years, the most important predictor of a long life is a strong social network. "It's important to do things that tie you to ongoing social or community groups," says Howard Friedman, Ph.D., a distinguished professor of psychology and a researcher with the project. This could involve volunteering, supporting a local charity, or doing work with a religious or political group, he says. These activities bestow a sense of fulfillment and belonging that fights loneliness and depression, two markers of deteriorating health. 9. Find A Workout That Doesn't Feel Like Work. It comes as no surprise that consistent physical activity is linked to a longer lifespan. The surprise was that regimented "exercise" was not the key. Instead, find active pursuits you enjoy, and invest in the instruction and equipment necessary to do them well. Rather than forcing yourself to descend into your musty basement to run on a dreadmill -intentional typo- take lessons in surfing, rock climbing, martial arts or some other form of fitness you enjoy. What investments are you currently making? The way I see it, the choices we make now encourage long-term medical care or self-sustaining longevity. You're the one holding all the cards. Newer Postwhat NOT to say to a single girl.